Are you contemplating how to spend your weekend out of the city? Well that is a good plan because there is no place you’d rather be. Your friends have probably suggested a few interesting places but Ellington safaris has a better idea. 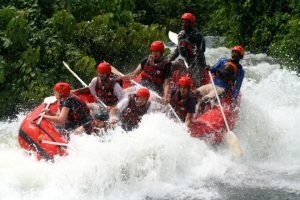 What if your itinerary could read like this: White water rafting and hot air balloon at the source of the great river Nile, Rhino tracking, birding and spot fishing at Murchison falls, game drives and bush breakfast at Queen Elizabeth National park, boat cruise, beach fire, and a luscious tilapia meal at the Ssese Islands! Think about it. The source of the world’s longest river, the most powerful waterfalls in the world, the largest savannah game park in the country, and the most beautiful fresh water islands in the region all to be explored in a single itinerary package! The great river Nile is Uganda’s most prized tourist attraction. The mighty river starts its journey at Lake Victoria somewhere in Jinja, flowing northwards through six countries into the Mediterranean Sea. There are more than twenty interesting experiential activities at the source of the Nile in Jinja. After a brief photo shoot at the source of the Nile and sightseeing at Bujagali Falls, guests retreat to a safari pleasure of their preference. For the tourists that have a passion for the waters, activities include; White water rafting, Kayaking and canoeing, boat cruise, and Bungee jumping. Maximum safety is guaranteed since all the companies that offer these activities are licensed by the safety organization. An equally enthralling experience awaits you on the undulating terrain at the banks of the Nile. Top things to do here include; Quad bike riding, mountain biking, horseback riding, nature walks and sightseeing, waterfalls viewing, and cultural site visits. The Nile rapids stretch for a distance of about 24 Km from its source. This means four full hours of rafting and kayaking pleasure! The waters are warm and pleasant with an average temperature of 27 degrees. Experienced rafters will tell you that a pleasure like this cannot be found anywhere else in East Africa. Then there are house boat safaris! You and your friends have the opportunity to sit on a boat with all house facilities and sail the Nile for hours. The boats are self-contained with toilets, bathrooms, and a kitchen. This is the perfect idea if you want to explore the Nile in the gentlest and most comfortable way. Another equally thrilling boat activity is the Sunset cruise. You do other things, wait for the sun to retire, and then get on a boat to sail on the wondrous river at the most beautiful time of the day. You may also want to ride a horse on the banks of this famous river, or get on a Quad bike and ride the night away. These are some of the cheapest but most enchanting activities to take part in. An hour on a quad bike will cost just 40 US dollars. Three hours is 80 dollars. If these don’t interest you, you still have fun options like visiting the Bujagali, Rippon and Kyabirwa waterfalls. The sights are incredible and a nature walk is not a bad idea. You can also choose to visit one of the beaches on the shores of Lake Victoria, or the islands closest to Jinja. The Nile tour also offers incredible birding and fishing opportunities. Cycling and Biking. If you are an avid cycler and mountain biker, you can also hire a bike for a few hours, or half the day, and take a ride into the villages for an unforgettable cultural encounter with the locals. You will be amazed to learn about African culture, beliefs and superstitions. Don’t forget to ask about Jaja Nabamba Budhagali- the acclaimed Witch doctor who is believed to be the custodian of the ancestral spirits that ‘guard’ the Nile. If African traditional religions interest you, you may spare some time and visit the man himself at his spiritual shrine in Bujagali. You will be tired and worn out after all the fun, and Jinja has the best lodges and hotels for you to spend the night. The safari lodges range from budget facilities to midrange and high-comfort options. If your pocket is heavy enough, you may choose any of the following high-end lodges to spend the night: Jinja Nile resort, Nile river camp, Holland park, Nile perch Camp, Roots Safari Resort, King fisher safari resort, The Haven, Explorers river camp, The Nile village hotel, Victoria forest Resort, Hotel paradise, Signature hotel Apartments, Nile river camp, and so many others. Feel free to contact Ellington safaris for the best choice of accommodation. We will help you choose a hotel with the best services, the best facilities and, of course, the most spectacular views of the Nile. The best lodges to us are those that have all, or nearly all of the following facilities; Swimming pool, Sauna, Spa and health club, In room massage service on request, Bed and Breakfast, deluxe self-contained rooms, a terrace overlooking the river, indoor games, conference facilities, wireless internet, well stocked bars, and more! Bring all your friends if you can. Jinja city may not offer much if you are a lone traveler. Imagine sitting on a kayak alone for hours! 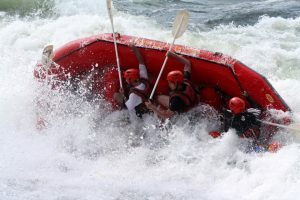 Or Rafting the Nile with no one to share the fun with! When people speak of Lake Victoria in East Africa, attention is focused primarily on the volume of its waters and its reputation as an inland sea; the source of the great river Nile and the world’s second largest lake shared by three countries. Little praise has been sung of the stunning geographical features found in this immensely attractive fresh water lake. Within Lake Victoria lie a host of breathtaking islands with beautiful sandy beaches, great swimming spots and perfect fishing zones. Northwestern Lake Victoria hosts an unusual cluster of 84 islands with different sizes and attractions. Together, the islands are referred to as the Ssese islands. It takes approximately 3 hours to reach Ssese by ferry from the mainland at Entebbe. Ssese is located is located along the equator. It blossoms with the most clement tropical climate in Uganda, and the country’s most attractive beaches. 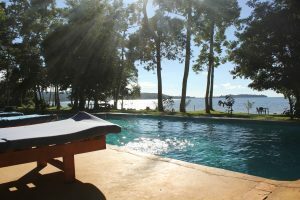 These quietly magnificent islands have been a favorite chilling place for the royals of the Buganda kingdom and are quickly gaining reputation as one of Uganda’s top safari destinations. Ssese Islands receives more honey moon visits than any other place in Uganda. Its balmy tropical weather, relaxed white sandy beaches, and perfect location in the heart of Lake Victoria are its most charming attributes. Tourists have been fascinated by the beauty of its beaches, and the abundance of fresh fruit, vegetables and spices in the local markets. Given that Uganda is a landlocked country, Ssese Islands remains one of the top destinations for Swimming, boat cruising, quad biking, bird watching, canoeing, and wind surfing. Fishing is the most enthralling of all the must do activities at Ssese. Beach fires are a cherished custom at the islands and a meal of roasted tilapia and Nile perch is only escapable by allergy. Accommodation is improving fast at the island. An impressive range of new hotels, lodges, guest houses and camp sites have been constructed in the past three years to cater for tourists of all budgets and preferences. For the best camping experience, visitors may spend a night at Ssese habitat resort, Mirembe resort beach, and palm garden beach. Other luxury hotels in the area include; the Ssese islands beach hotel, philo leisure gardens, Ssese islands beach hotel, Brovad sands lodge, Explorer’s hub, Ssese Palm Beach resort, Bukasa Island Retreat, the Luxury resort, and the Islands club. Facilities offered at these deluxe hotels and guest houses include; free internet, camp fires, conference facilities, spa and health club, international and local cuisines, saloon services, and airport transfers. Extra activities are organized and differ from hotel to hotel. The commonest activities offered are; canoeing, spot fishing, nature walks, and biking. Make your bookings now. Send us an email at [email protected] and let us plan the holiday together.